The picture shows, from top left clockwise: Dr. “Mi qi” and nurse “Mi ni” on a paper pad, Oil pastels (these are what the children use as crayons), pencil cases, candy boxes (these are obviously a little different but still had Disney), backpacks, and a notebook for English practice. All products pictured are official Disney products. Life in China 2016: A Picture A Day, July 14 – Today we went to the Shenzhen Museum to see some special exhibits; One was about Burial Tombs of the Han Dynasty (206BC – AD 220). It was something I hadn’t learned about before and it was interesting how similar the practices were to the Ancient Egyptian burials and tombs. Over 10,000 underground brick and stone tombs have been discovered throughout China! This exhibit was of relics from the province of Sichuan. Statues were made to represent all the comforts of life, and were placed inside the tomb, and these “image bricks,” either molded or carved, were used to decorate the inside of the tombs. The images on the bricks portrayed important aspects of life: eating, farming, hunting, transportation, entertainment, etc. Statues represented the same things, and murals were also used. It all reminded me of the items that are made of cardboard and burnt for the dead in in modern day China. Life in China 2016: A Picture A Day, June 25 – I’ve posted a couple of the Chubby Women series by Guangzhou artist Xu Hong Fei. Here’s one more that is along the shoreline of Songshan Lake. 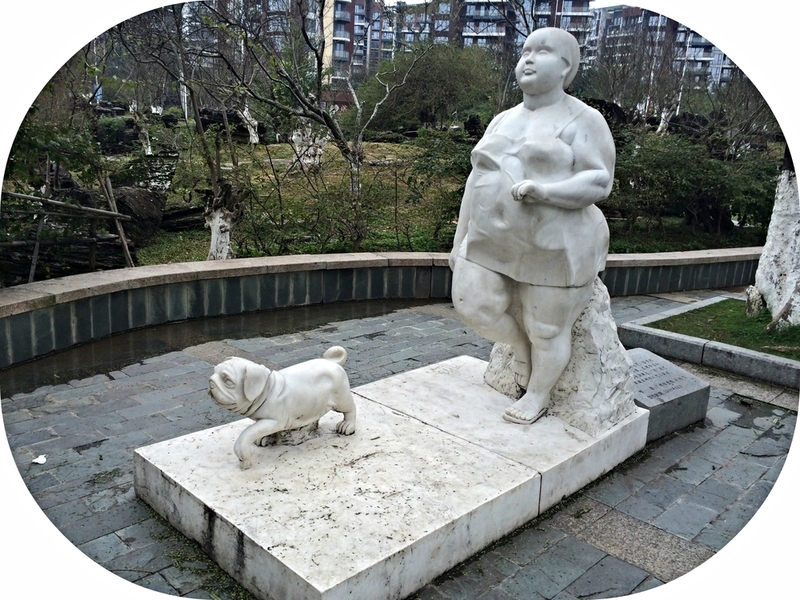 I’d like to share another one of Xu Hongfei’s Chubby Women sculpture series that are along the shoreline of Songshan Lake. This one is called “Mother and Child”; There are quite a few in the series with mothers and babies or small children, but I think this one shows a much more tender side where the others are more “fun.” The description on the base says how a child needs his mother’s loving care in order to grow up healthy. Today we visited the Nantou Ancient Village in Shenzhen. People tend to think of Shenzhen as just a modern city because 30 years ago it was just a fishing village, not a known city. But…people did live there, and there is history to be learned! Shenzhen grew up rapidly around the villages. Unfortunately, these old villages continue to be torn down to make room for high rises. Nantou is one old town that some effort has been made to preserve. The preserved South Gate dates back to 1394, when it was built as part of the wall around the town. It is a place where you can see the contrast of old and new. One feature I enjoy of old (and reproduction) Chinese architecture is the eaves tiles, called wadang. Their purpose was to protect the wooden rafters by blocking the rain and wind as well as being decorative. The first ones known date back to about 1000BC. The close-up picture is from the old bank building and the other shows the old Government offices. You can see the roofs with eaves tiles in the center and on both sides.